Tomorrow is the official start of Psoriasis Awareness Month. 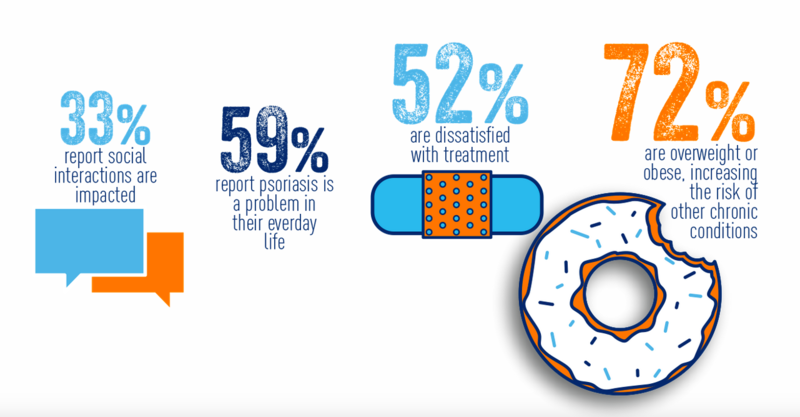 The National Psoriasis Foundation (NPF) wants people with psoriasis to know they are not alone: Over 7.5 million people in the U.S. have been diagnosed with the condition, and more than 4,800 people with psoriasis are sharing what it’s like on PatientsLikeMe. What does psoriasis look like? It’s a skin condition caused by unknown factors, and most people have red, itchy, scaly patches, especially around their knees, elbows and scalp. Psoriasis IS NOT contagious, yet people living with this skin condition often experience stigma when others notice their symptoms. The NPF has a calendar full of events to create awareness about treatments, and offer support for the psoriasis community. Visit their website to learn more about what’s going on in your city or town. You can join “Team NPF” to participate in a walk, run, or other fund-raising event near you. During Psoriasis Awareness Month, check out PatientsLikeMe posts on psoriasis, including the results of our “Uncovering Psoriasis” surveys, patient interviews with Maria, David and Erica, and learn what doctors Jerry Bagel and Steve Feldman have to say about psoriasis. And if you’re living with psoriasis, don’t forget to connect with the community at PatientsLikeMe.